There are too many good board games on the market for my store to carry, and I think this is true throughout the trade. 2016 was the first year I stopped carrying board games that met all my performance metrics. The primary metric is turns, with three being a minimum turn rate for this category for me. The average is now around six. With sales so strong, there just wasn't enough money in the purchasing budget to carry everything good, so good games gave way to great games. 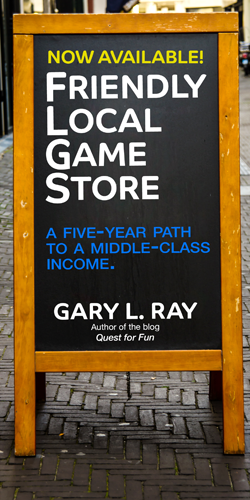 Inventory, whether it be store inventory or distributor inventory, is a zero sum game. There is only so much money in the pie and if I have to bring in one thing, it means something else has to go. You might be reading this and thinking, well sure! That's just common sense. However, that's not how this trade usually works. It's often a case of stand out hits propping up a lot of crap. An enormous pink pond of pig poop, surrounding a few prize hogs. For my board games, there is no crap, no propping, the market is on fire. It's all tasty bacon. I can't find enough product like this in RPGs or miniatures, it's fairly unique to this one category. I would throw thousands of dollars at RPG publishers, if they had something for me to sell. They just don't, at least not without a lot of time consuming farming. This embarrassment of riches has migrated to purchasing. I've begun using the same strategy as my customers. All things being equal, games are bought on pedigree. A great board game from a top publisher not only gets picked over a great board game from a one off publisher, but it gets bought deeply. And if budget allows, very deeply. There are break out hit exceptions, but we have top 30 publishers where it's not a question of if I'll carry a game, but how many. By the way, this does not mean mediocrity from name brands sells well as in the past. Customers are well researched and don't buy entirely on brand. A solid brand is a guarantee of no surprises, like poor component quality or rule sheets ran through Google translate. I'm planning a larger board game budget for 2017, but it's not about expanding my breadth, it's about jumping on board game intelligence when I get it. Games like Terraforming Mars and Scythe were hot in 2016, but we couldn't get them without a deep order. We didn't have the cash, so we lost out. We had an angry review recently from a customer because we lacked product knowledge about Terraforming Mars. That's because we had it for 10 days in October and never saw it again. What can I tell you about that? It's rectangular with nice artwork, as I vaguely recall. What does this likely mean for the game trade? I think it will mean increased balkanization, with Kickstarter games lacking penetration into brick and mortar. I think it will mean distributors will take the same approach as us, essentially not taking new clients and using their budget for big hits. Small publishers are likely shut out. Metrics for picking up a new game will increase. Good is no longer good enough, we all want great. It should also mean retailers like me need to dig deeper, go to more shows, play more games and network with like minded individuals to crack the code of hotness. 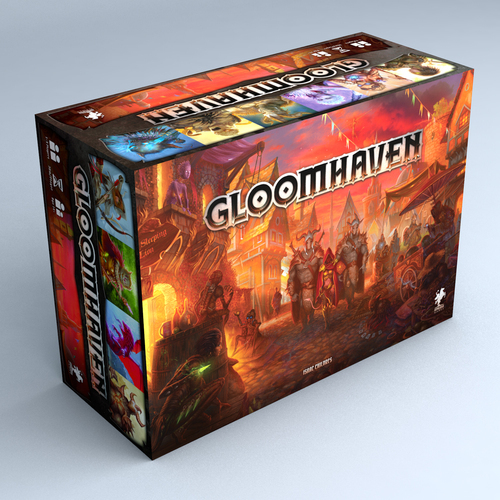 Gloomhaven is one of those "go deep" games in 2017. It's a $120 Kickstarter game, currently at the number one "hotness" spot on boardgamegeek. It's sold out on release but still open for pre order at distribution (I'm encouraging my customers to put theirs in). I'll get my copies and won't expect to ever see it again. I could be wrong. Also, someone will point out there are areas of the country where a $120 board game is a non starter. I think if you consider it an RPG cross over, with legacy game mechanics, $120 isn't a big commitment for a group.